The global ABS (Acrylonitrile Butadiene Styrene) resin market is the largest market in 2017 and is expected to grow at a highest growth rate in the forecast period. The global consumer demand is growing with 4.55% over the period 2018-2023. The ABS Resin market is driven by the growing demand for household appliances and electronic devices owing to the increasing purchasing power of the middle class population across the globe. ABS is made from styrene, butadiene, and acrylonitrile. 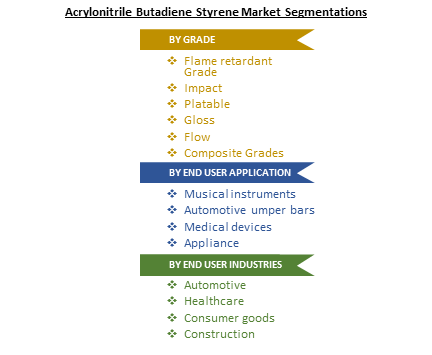 Acrylonitrile is a synthetic monomer produced from ammonia and propylene; butadiene is a petroleum hydrocarbon acquired from butane; and styrene monomer, is obtained from coal, commercially found from ethylene and benzene from coal. ABS a thermoplastic resin generally used for applications like injection molding. The benefit of ABS is the combination of rigidity and strength of styrene and acrylonitrile polymers with stiffness of polybutadiene rubber. ABS resins are regularly used in polymer amalgams for various different requests, to achieve the unsurpassed properties from the shared product. This report gives an in-depth analysis of the ABS Resin market by grade, application, and geography. The major grades of ABS resin encompassed within the scope of the report include Gloss, Flow, and Composite. What are the major applications for PC-ABS resin? ABS is an economical engineering plastic that is easy to fabricate and machine. Although, the derivative PC-ABS resin is not low cost it is an ideal material for applications when impact resistance, strength, and stiffness are required. PC-ABS is one of the most widely used industrial thermoplastics. These can be used for molding parts requiring close dimensions, outstanding surface finishing, high impact resistance, and metal plating. The exclusive mishmash proposes a perfect amalgamation of thermal and mechanical properties for appliances, such as transportation and automotive, medical, electronics, consumer products, electrical, communication and IT applications. The applications considered in the market scope are household appliances and electronics. There is a rising demand in the electronics sector for 3D printed PC-ABS parts utilizing digital image correlation. 3D printing material achievements have skyrocketed over the past five to ten years, and PC-ABS is one among them. The demand for ABS resin in Asia-Pacific (APAC) will be strongly supported by high investment and consumption activities due to consumer confidence, low interest rates and increasing per capita income. China is the largest consumer of ABS resin, as the demand for consumer and household electronic appliances is high in the country. Moreover, the electric component market is growing due to the increase in consumption of EMI shielding grade ABS blends in electrical housings and cabinets, wires and cables, and electronic assemblies. In the Asia-Pacific region, emerging economies like China and Japan are the frontrunners for the PC-ABS resins market followed by India. In Americas, the U.S. is a major market for PC-ABS resins, and is followed by Brazil and Canada. Germany, Italy and the U.K are the key countries in the European region owing to their high growth in packaging industry. Electrical and Electronics sector remains the highest in terms of global revenue generated as special grades of PC-ABS resins are required to provide special properties such as flame proofing and high flow ability to the sophisticated instruments . Who are the Major Players in ABS resin market?